Jun Ishikawa delivers a statement at the Conference of State Parties to the Convention on the Rights of Persons with Disabilities (CRPD) in 2014 at UN Headquarters in New York. If you have poor vision, glasses are highly likely to help you enjoy a better quality of life and work longer. If you are a driver with poor vision, glasses could well extend your life and others on the road will be safer as a result. If you are an employer your workers will be more productive if they can see what they are doing. Sometimes we need to state the obvious – so I have. Why? Because there are 2.5 billion people on this planet with poor vision who lack access to sight tests and therefore glasses. That’s a third of the world. For the past three years, the Clearly campaign has fought to draw attention to what we call the world’s largest unaddressed disability – poor vision – and we are making progress. At last politicians have begun to take notice: the Commonwealth Heads of Government Meeting in London in April became the first international forum to formally acknowledge this problem when it committed itself to take action towards achieving “quality eye-care for all”. Now it’s time for business to step up to the plate. First, let me provide some evidence from the ground-breaking Prosper [PROductivity Study of Presbyopia Elimination in Rural-dwellers] research paper published recently in The Lancet. A randomized controlled trial of tea-pickers in India, sponsored by Clearly, and carried out with VisionSpring and Orbis, demonstrated that providing reading glasses to them improved their productivity by 21.7%. For those older than 50, the increase was 31.6%, representing the largest ever recorded productivity increase from any health intervention. Based on this research, the productivity benefits of providing glasses – which cost as little as $1.50 to make – equate to an extra day of work each week. Quite frankly helping your workers to see properly is an economic and social no-brainer. As such, I have challenged some of the world’s biggest businesses to act. I have written to 120 of them –including companies like McDonald’s, Walmart and Amazon – urging them to provide free eye tests to all their staff whether employed directly or in their supply chain. Some companies in the western world are required to do so by their national governments. In the UK, for example, health and safety rules mean that many workers are entitled to a free eye test. But across developing countries, there is no such requirement. If you’re a CEO and don’t offer this simple benefit, think about it. It makes sense. I am helping these companies, who together employ 20 million people, understand that if they arrange for their workers to have their eyes tested they will become more productive and will save lives. Work-based vision programmes are simple and cheap to implement and we have launched a petition with Global Citizen to drive support for this idea. Who wouldn’t want to save lives if they knew there was a simple way to do it. In the developing world, heavy and potentially dangerous machinery is operated by people with poor vision and there are few sight tests for drivers, contributing to road traffic accidents, which in Africa are the leading cause of death among people aged 15-29. The Indian study showed that for companies operating in low-to-middle-income countries free work-based sight tests and affordable glasses can provide a game-changing productivity boost and improve workers’ quality of life. It is a crying shame that the world did not wake up to this earlier. Glasses, after all, were invented 700 years ago. Governments, at last, seem to be taking action on something of which they should have been aware decades ago. The Commonwealth leaders commitment was a great step and I won’t be churlish about that, but it is now time for business to follow. Not only is this the right thing to do but we now have proof that it will benefit your organization. Some companies are leading the way. Williams Sonoma, a US retailer, is working with the NGO Vision Spring to provide full-vision services for at least 20,000 workers in India and the Philippines. Discovery Health is providing eye screenings for drivers to make the commute to school safer for children in South Africa. Uber Kenya is working with local optometrists to provide free vision screenings and affordable glasses for thousands of drivers. This is great progress. I am hoping that many more companies will act on this simple yet transformative measure. Not only will you boost your organization’s productivity but you will also be tackling this massive disability – and the big bonus is that you will help the world towards the UN’s sustainable development goals. 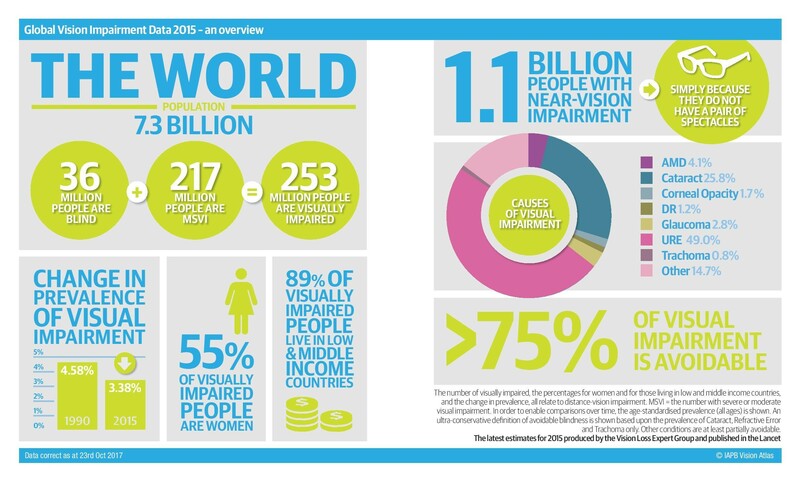 Vision is not just a health issue; it is the golden thread to implementing many of the SDGs. How on Earth can we achieve the elimination of poverty, good health and well-being; high-quality education, decent work and economic growth; and gender equality if people cannot see properly? Business must act now, for what is a win-win. You will improve your workers’ well-being and their satisfaction at work. At the same time, your own bottom line will receive a boost.